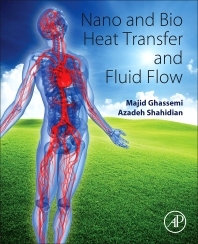 Nano and Bio Heat Transfer and Fluid Flow focuses on the use of nanoparticles for bio application and bio-fluidics from an engineering perspective. It introduces the mechanisms underlying thermal and fluid interaction of nanoparticles with biological systems. This book will help readers translate theory into real world applications, such as drug delivery and lab-on-a-chip. The content covers how transport at the nano-scale differs from the macro-scale, also discussing what complications can arise in a biologic system at the nano-scale. It is ideal for students and early career researchers, engineers conducting experimental work on relevant applications, or those who develop computer models to investigate/design these systems. Content coverage includes biofluid mechanics, transport phenomena, micro/nano fluid flows, and heat transfer. Professor Ghassemi has been teaching graduate and undergraduate courses and conducting research in area of heat transfer and its application in drug delivery, fuel cell and alternative energy since 1993. He has over 21 years of academic and industrial experience and served as Chancellor of K. N. Toosi University from 2010 through 2013. He is an Editor-in-Chief of International Journal of Prevention and Treatment and Managing Editor of American Journal of Mechanical Engineering (AJME). Azadeh Shahidian is an Assistant Professor of Mechanical Engineering Department at K. N. Toosi University of Technology in Tehran, Iran. She received her B.Sc. And PhD degree in Mechanical Engineering from K. N. Toosi University of Technology in Tehran, Iran. Dr. Shahidian research focused on the numerical and experimental investigation of nano and bio-fluid properties and behavior. She is currently teaches graduate and under graduate courses and conduct research in the area of heat transfer and its application in drug delivery, Energy management and Bio-fluid mechanic. Dr. Shahidian has 15 years of academic and industrial experience and supervised several undergraduate, masters and PhD students. Dr. Shahidian has published over 25 papers in well-known journals and conferences.